Some people give a lot of attention to detail. Here Betsy is using a coil to reinforce a joint in her slab built pot. She told me once that she used to make pottery years ago. After watching her work I could tell. Once a potter always a potter? Here are some more shots of the slab building process. In the second to last photo, Zoo Mike used bark to get an interesting texture on his pot. I am so proud of him! Paul is very quiet when he works. When you see his pots you will know why. Such concentration! 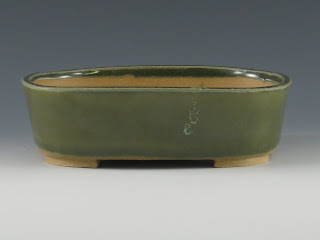 Well, I am off to wash off the bisqued pots and get them ready for our glazing class next month. All of the pots make it through the bisque with no problems so I am very happy. Overall the class went very smoothy, but I should have taken more pictures to share here. I will try to take more on the 13th when we meet again. Thanks to all the participants for your patience and support! 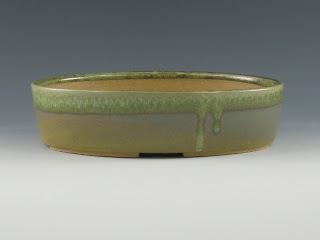 Experimenting with glazes and overlaying them can be rewarding, even if the result dosen't always turn out as expected. 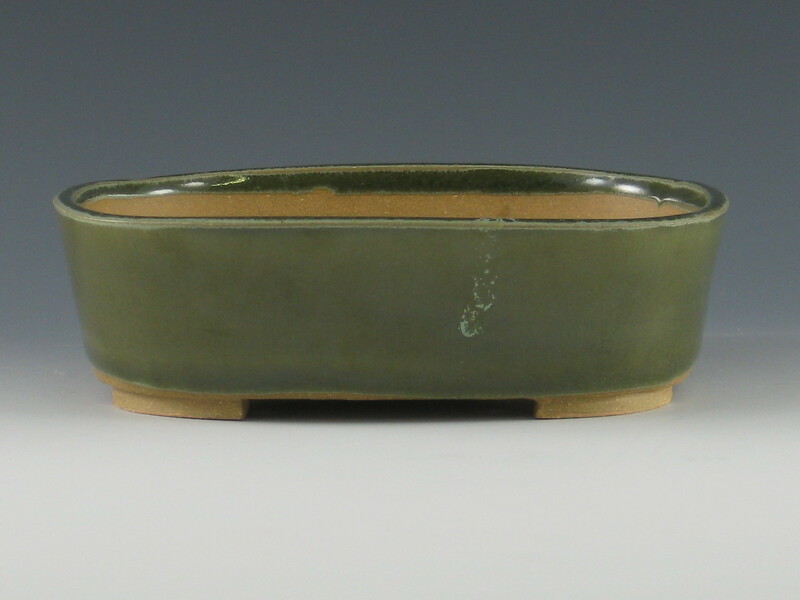 I like the look of the Spearmint from M^6 Glazes. Here is contrasts with a single dip of Varigated Blue. The body is Brownstone from Highwater fired to a hard ^5. I had to use my small 40+ year old electric Jenkins kiln for this load, as I was in a rush to finish some commissioned pieces and didn't want to spend time filling up the bigger Olympic gas kiln. Here is the soft corned shohin sized rectantangle. 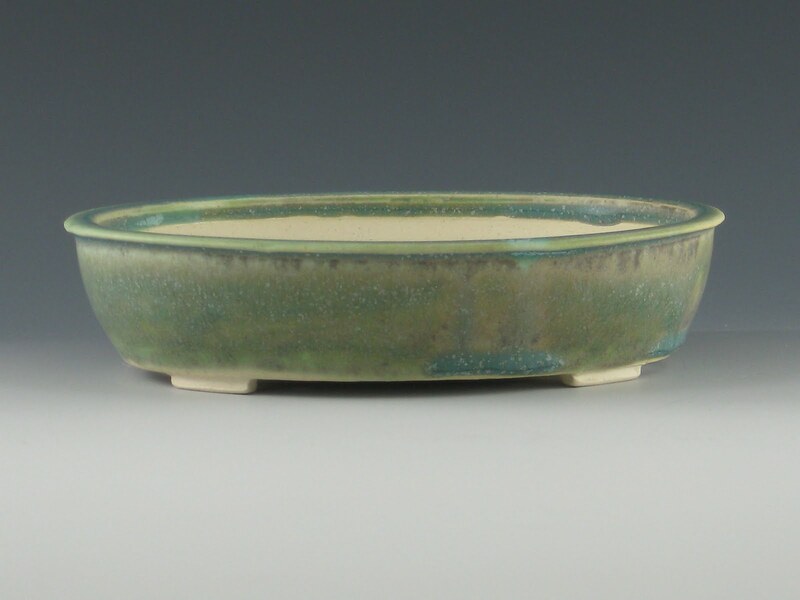 Because the glaze couldn't slow cool, (it is very hard to do in this kiln), and because it was perhaps too thick an application, the white fades into the main glaze. I like the way the drips played out in this next pot. Being that there is more color variation within the grey and green tones, the drip feels more at home visually. 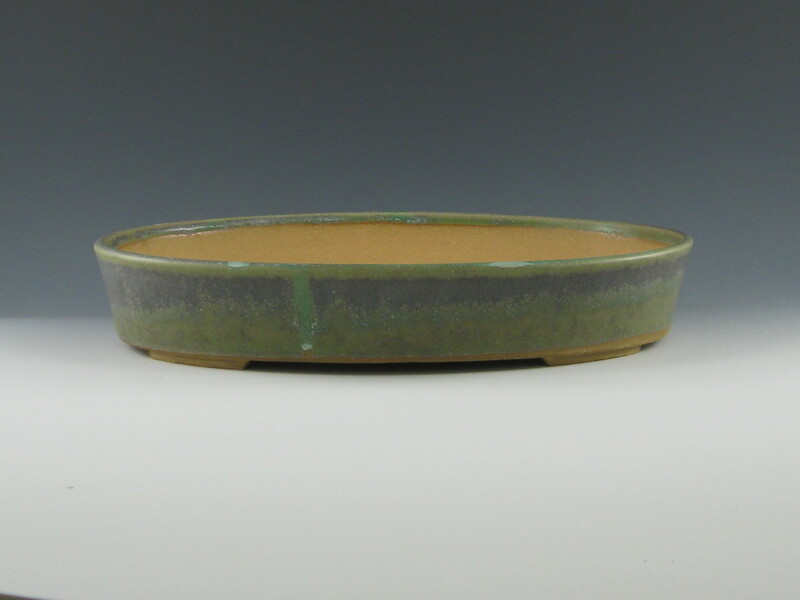 Here is the same glazes with a different clay, a half stoneware and porcelain mix. 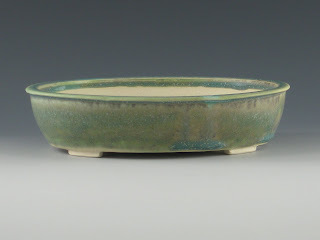 Because the body is white, the glaze is more bright, less austere. The drip ran all the way down the pot's side and pooled just before falling onto the shelf. I guess I should consider myself lucky eh? Well, I will keep working on the perfect drip. I may never achieve it as something perfect, but that should be the point. If too much time is spent trying to create that which is supposed to appear spontaneous and random, then how can we call it wabi-sabi? Anyway, thanks for letting me share! 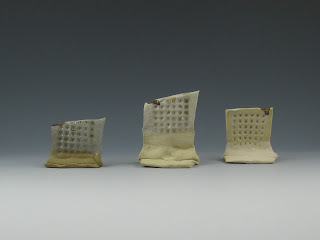 Here are some tests of three midrange clay bodies. The first (below) is a Red Iron Oxide wash, mixed with Ferro 3124 and EPK in thirds by volume. I chose three clay bodies, (from left to right) Brownstone, Desert Buff, and Half and Half, all from Highwater. The drip on the left side of each tile is a pure Oak ash, washed and screened mixed with water. This is a similar test of washes using ash and MgO, mixed in the same proportions as the test above. 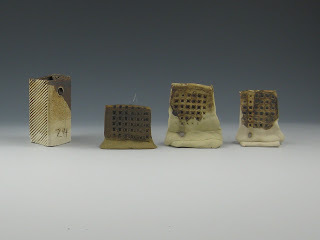 The first tile, however is Max's White Raku clay from Axner. Here are the Highwater Clays again, this time using Bone from Mastering Cone 6 glazes. 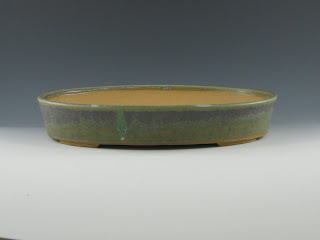 There is a drip of the MgO wash on the corner of the tiles that works well with the glaze. All of these tiles were fired to a full cone 7 in heavy reduction. Well, more testing is on the way. 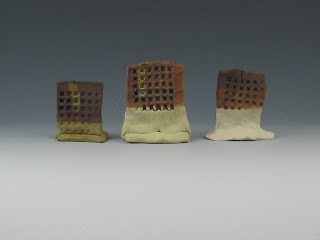 I really like seeing what I can do with these three clay bodies. 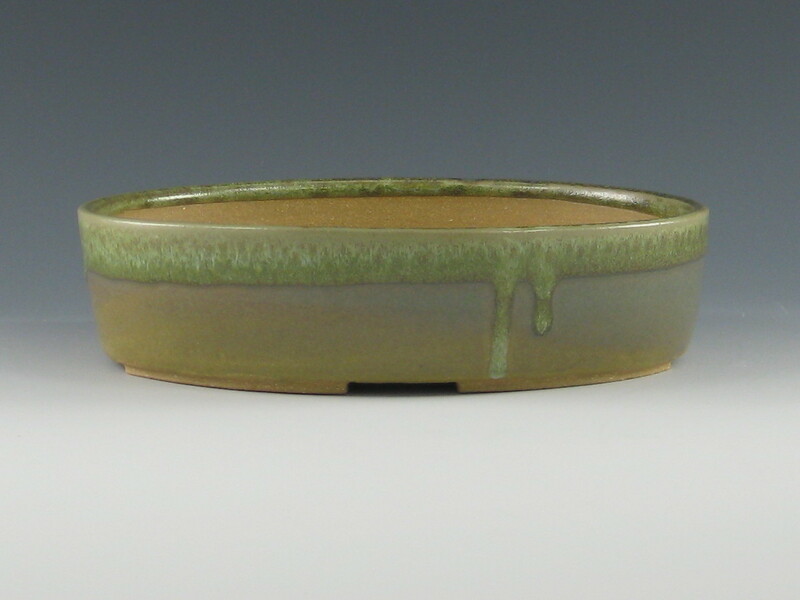 I think the Half and Half is a sure winner with the Bone glaze, as it brings out a warm hue. I can't wait to use this clay to make some medium to small sized oval bonsai containers.